As Stirchley Baths prepares to open its doors one last time before the building’s conversion into a community centre, local historian and member of Friends of Moseley Road Baths Steve Beauchampé looks back at the Baths’ history. Saturday, September 3rd affords what is expected to be the last opportunity for the public to see inside the 100-year old Bournville Lane Baths. Located on the corner of Bournville Lane and Hazelwood Road in Stirchley, work is expected to commence early in 2012 to convert the building into a community centre as part of a financial deal linked to the development of a new Tesco store in Stirchley. The Baths, which closed on March 1st 1988 and which have lain derelict for several years, slowly ravaged by the weather and wildlife, will be open between 11:00am-3:00pm. Designed by architect John P. Osborne, Stirchley Baths (as they were originally called) cost approximately £10,000 and were built by E. Crowder of Farm Street, Birmingham on land gifted to the Kings Norton and Northfield Urban District Council by Cadbury Brothers Ltd. At 4pm on July 19th 1910 William Cadbury laid the Foundation Stone and the following July George Cadbury Junior formally opened the building, which is now listed Grade II. Along with Aston and Handsworth, on November 9th 1911 Kings Norton was annexed as part of the Birmingham Extension Order. From this date the facility was known as Bournville Lane Baths. There was a single swimming pool (75ft x 30ft) with spectator gallery, demountable dressing cubicles, 20 private washing (or ‘slipper’) baths for men and women and a small steam (or Vapour) bath, capable of holding six people. There was also a small laundry. 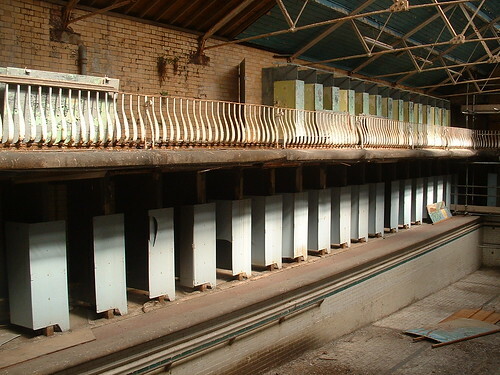 With its distinctive curved single-storey frontage, Bournville Lane Baths was the first of the city’s baths to be connected to the mains water supply and were fitted with a modern circulation and filtration system supplied by Riley’s of Irlam. Located just a few hundred yards from the impressive – and also long decommissioned – Girls’ Baths at Cadburys’, the facility was developed in conjunction with the adjacent public library, while a Friend’s Meeting Hall sits directly behind. As part of Saturday’s open day members of the public will be invited to become a ‘Friend of Stirchley Baths’, a new group dedicated to ensuring, ‘that the building serves the people of Stirchley for the next 100 years’. To get you warmed up for this year’s Memories and Memorabilia Day on 30th October, we wanted to share with you once again the excellent video that Alex Gamela and colleagues at HashBrum put together of the tour. Don’t forget that you will need to book this year’s tours in advance by e-mailing your preferred time to memories@friendsofmrb.co.uk or ringing us on 07967 093 256. Moseley Road Baths Tour from Alex Gamela on Vimeo. We’re very lucky as a group to be able to draw on the expertise of one of our group members, Steve Beauchampé. He and Simon Inglis, who many of you will remember from his excellent presentation at our ‘Memories and Memorabilia Day‘ have written extensively about our local sporting heritage. Moseley Road Baths features in two of the wonderfully detailed and illustrated publications from the ‘Played in Britain’ series. 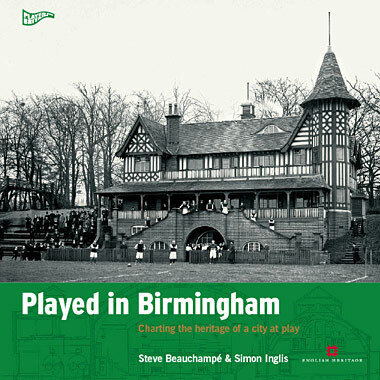 ‘Played in Birmingham‘ explores Birmingham’s sporting heritage, whilst ‘Great Lengths‘ focuses on the development of swimming baths in Britain. We are very excited to announce that they have both been invited to deliver a lecture at the prestigious Barber Institute this March. Full details are below – please contact the Barber Institute directly for all enquiries. Birmingham is a city founded upon hard work, enterprise and civic pride, characteristics that have also helped to shape its sporting map. This richly illustrated lecture focuses on Birmingham’s historic sporting landscapes – from stadiums to swimming baths, parks to pavilions, golf clubs to billiard halls – and reveals little known aspects of a heritage that has touched the lives of millions of Brummies, whether inclined towards sport or not. Simon Inglis is an architectural historian and editor of the English Heritage series Played in Britain. He is the co-author with Steve Beauchampé of Played in Birmingham, the fifth book in the series, and has also written a history of Villa Park. Steve Beauchampé is an expert on Birmingham’s sporting architecture and heritage and is currently writing a history of the Grade II* listed Moseley Road Baths in Balsall Heath. All lectures are held at the Barber Institute of Fine Arts and begin at 7.30pm. Lectures are preceded at 6pm by a finger buffet, including a choice of wine, soft drink or coffee, and a private view of the Barber Institute galleries. Admission is by ticket only. Lecture and buffet: £15 per ticket or £55 for the series. Lecture only: £7.50 or £27.50 for the series. Payment by credit or debit card; cheques are payable to the University of Birmingham.